Syria’s Permanent Representative to the Organization for the Prohibition of Chemical Weapons (OPCW) Bassam al-Sabbagh affirmed on Wednesday that Syria categorically rejects the campaign of allegations and accusations about the use of chemical weapons based on fabrications launched by US, UK and their Western allies against it. 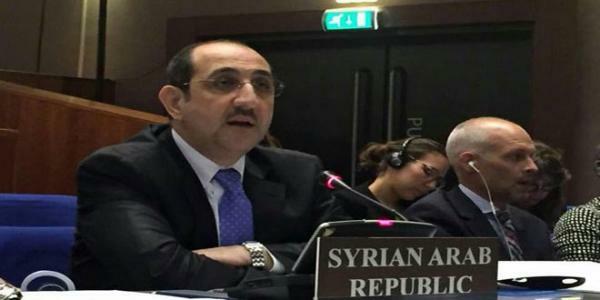 In a statement delivered at the 88th session of the OPCW Executive Council, al-Sabbagh reiterated Syria’s strong condemnation of the use of chemical weapons by any person, anywhere, and under any circumstances. “Syria’s commitment to an exemplary implementation of the Syrian chemical weapons’ elimination process in a short time frame and amid complex security conditions is a real success story for Syria, but it is ironic that the US, which is the only country still possessing a huge chemical arsenal that appears to be in no hurry to end its destruction and comply with the deadline, does not stop criticizing Syria for not implementing its commitments,” Sabbagh said. He affirmed that the recent adoption by the conference of member states of a resolution authorizing the OPCW to determine responsibility for the use of chemical weapons not provided for in the provisions of the Convention is a matter of deep concern and constitutes a dangerous precedent in the international system due to its clear violation of the competence of the international body on security and peace issues. He added that in this regard, Syria warns that the countries that stood behind the adoption of this resolution will use it as a legal cover to launch further acts of aggression against Syria and shed the blood of its people. He pointed out that Syria believes that this resolution will only serve to add new complications to the work of the OPCW and its ability to play its role, increase the divisions between its member states and push them towards further polarization.